At Forum Dental, we know how important it is for you to have a smile that is healthy and bright! If your teeth have become discolored, teeth whitening may be a great option for you! We’re very excited to be able to offer custom whitening programs, because everyone deserves to have a smile they are proud of. Maintaining a healthy oral hygiene regimen is key to achieving and maintaining a bright smile, but there are many things can affect the color of your teeth including smoking or drinking dark colored sodas, teas, coffees and even eating dark colored fruit. While you can acheive a whiter smile with store-bought products and over the counter remedies, our professional teeth whitening services can help you achieve a whiter smile almost immediately; store-brought products would need to be used consistently over time to reach the same results due to lower potency. At Forum Dental, our professional whitening services are tailored to fit only your teeth, which ensures a more even and brighter smile! Subscribe To Our Newsletter And We'll Send You a Free Whitening Coupon! We want to see you smile! Just for joining our mailing list, we'll send you a free whitening coupon to use at your first appointment! Every so often, we will send you additional email offers for specials at the location near you. Thanks for joining! Check your email for your free whitening coupon! 100% Secure, we will never share your info. 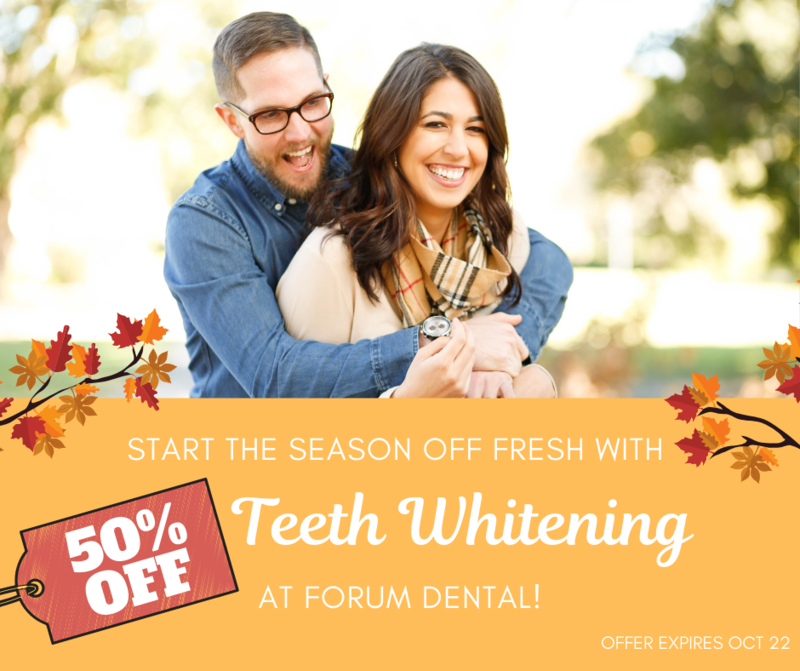 We’re celebrating the changing of the seasons with our most popular promotion — 50% OFF ALL PROFESSIONAL TEETH WHITENING! Start the season off fresh with your brightest smile yet! This is a limited time offer while supplies last through October 22nd. Give us a call or request your appointment online, we can’t wait to see you!